By the end of Complete Finnish you will have a solid intermediate-level grounding in the four key skills - reading, writing, speaking and listening - and be able to communicate with confidence and accuracy. 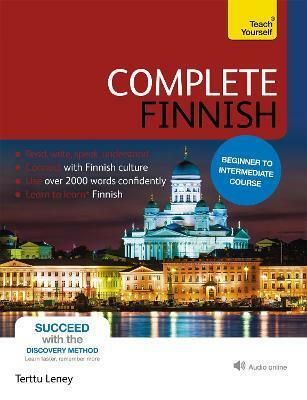 *Complete Finnish maps from Novice Low to Advanced Low level proficiency of ACTFL (American Council on the Teaching of Foreign Languages) and from A1 Beginner to B1/B2 Upper Intermediate level of the CEFR (Common European Framework of Reference for Languages) guidelines. 05: Have a pleasant journey! 08: What would you like? 10: Oh dear, oh dear! 11: Come and see us! 13: Excuse me, do you speak Finnish? 14: What is the weather like outside? 15: Beware of elks on the road!